Born in Mainz, his father was municipal bandmaster, coming originally from Pilzen. At 20 J.N.Kral, having learned the skills, became a bandmaster Amsterdam in 1859, and his career in the Austro-Hungarian Army started in 1862 as a military musician, and from 1866 onwards he managed seven different appointments as Military bandmaster over his career. His last was in the Marine Band, where, on his death in Tulin, he was superseded by Franz Lehár the younger in 1896. 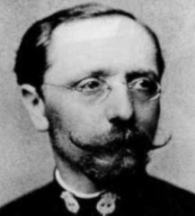 Like so many bandmasters he also conducted civilian bands, and his compositions therefore did not by any means comprise only marches, though he is best remembered today for his 1886 march Hoch Hapsburg. He was known as one of the very best Austrian Army bandmasters, and like many of his contemporaries tried to stay posted in Vienna, but of course that was far from possible over his lifetime. In 1885 or 6 he conducted the Civil-Elite Orchestra in open air concerts in the Volksgarten. His main dance genre was the polka in its various forms, but he also wrote potpourris, and a few waltzes.